The excitement is building in the trans-continental TechRadar offices. Yes, next Wednesday will bring the launch of Sony's PlayStation 4! 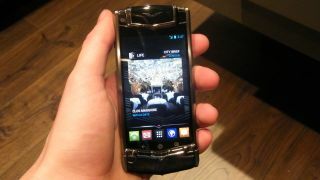 The Vertu Ti is the first Android smartphone from the luxury smartphone maker, although it's certainly not for everyone. But 'is it for me' we hear you ask? Let's be honest, no. Unless you've got money coming out of your ears and regularly travel the world. For Vertu has a very focussed market and although it may be a small one in the grand scheme of things, it's pretty much unrivalled in what it does. Think of the Vertu Ti as the mobile equivalent to a Mulberry handbag or Rolls Royce Phantom. It's an insane phone that will appeal to those with pots of money and the need to have a phone no one else has got, but it's also fairly poorly specced and comes loaded with an old version of Android? Still interested…? The space underneath our TVs is getting pretty cramped as we add various boxes to enjoy our media. Set top boxes jostle with Blu-ray players, consoles and DVRs. This is why the Roku LT is a breath of fresh air - its tiny body means that it can easily fit near your TV to stream media from services such as BBC iPlayer and Netflix. It can handle 720p video which it ouputs via HDMI – though don't expect to find one of those in the box! While BBC iPlayer is present and correct, there's no ITV Player, 4oD or other TV catchup services, and if you stream films via Lovefilm rather than Netflix, then you'll be out of luck for the time being. It's no secret that Windows 8 is an operating system that's geared towards touchscreen devices. This means if you haven't got a touch-enabled computer then you'll miss out on quite a few features and shortcuts of Windows 8. Logitech's T650 Wireless Rechargeable Touchpad is a solution to this, since it enables you to perform Windows 8 gestures no matter what your hardware is. Connecting it up to a PC is perfectly simple, and it comes with a Logitech Unifying USB dongle, which enables you to connect up to six compatible Logitech devices - such as the Logitech M600 Touch Mouse - to a single dongle. It's a good way to save USB ports - and of course to keep buying Logitech products.